With today’s release of Tempered, I’ve now put ten novels out into the world. In that time I hope I’ve grown as a storyteller (only readers can be the judge of that), and I’ve learned a lot about what matters to me in sharing my books. One thing I’m passionate about is this: telling the best story I can is more important than writing toward a particular genre. Self-publishing provides great freedom in that regard, albeit it’s harder for some books to be discovered by readers. Take the Scorched Trilogy… is supernatural dystopian a thing? How about urban dark but take away the vampires and witches and swap in another source of power? As another example, Chasing Blue Dots is absolutely a romantic story, but not a typical romance novel. Even in “science fiction romance” it doesn’t fit the mold, but it’s one of my (and my wife’s) favorite books. Another thing I’m consumed with is consistent “canon” when creating worlds and settings. Of course, I’m a “maps guy” and always draw out my ships or towns, even my galaxy. I also think very hard about establishing the boundaries of my characters. If they are bad at something, it’s a cheat to make them suddenly good to get out of a jam. Flaws make for great drama, and growth. Finally, I always work hard to paint the “bad guys” in my novels in shades of grey rather than straight-up black and white. You can’t have a great hero without a great villain and great villains need to be more than simply one dimensional. Hopefully, I’ve carried that tradition into Tempered. Good stories, consistent worlds, and nuanced characters. After 10 books, I’ve learned these are the most important things to me as a writer. If you enjoy those as a reader, take a look at my backlist and discover something new! Tempered is released today and I always love and appreciate reviews and feedback. I think every independent author thrives on them, so know that any feedback (whether in an e-mail or a review where you bought a book) will always, always be read by me. I hope you enjoy the second part of Kat’s ride in Tempered (the first book in the series is Scorched of course. The conclusion of her journey, Reforged, should land next year. … or check the other usual places you find my books! We’re less than a month away from the release of Tempered, the second book in the Scorched trilogy. Fans of This Corner of the Universe know I’m a “map guy”… the TCOTU galaxy is well over 100 worlds and will continue to grow. In contrast, Kat’s environment in Scorched and Tempered is far more intimate. The map is by no means a complete depiction of Kat’s world, and I reserve the right to change details right up to when I release Tempered (then it’s canon I have to live with). But, I like giving sneak previews to readers dedicated enough to follow my blog. The unfilled circles are towns such as Waytown. These are relatively low-tech settlements that essentially grew up to support an important industry (whether it be mining, like Waytown and the settlement in The Red Desert, or agriculture such as the town in The Eastern Expanse). Light grey circles are abandoned settlements. The community south of Waytown didn’t fair so well. Neither did the very small village between Northport and Waytown. The black diamonds are cities, perhaps ranging into the millions of citizens and having comparatively better technology. These are the major manufacturing centers, the places everyone wants to live. We’ll definitely be touring Coldbarrow and the capital, Northport, in the series. If you look closely, you can see tiny black dots representing actual mining and agricultural locations. Recore Mining is nestled in the mountain east of Waytown and the spur that Kat’s mag-rail takes to transport her to work is marked near it. Dark lines are mag-rails, the primary long distance means of transportation. The light grey lines are actual roads. Region names were developed to give a general impression of those parcels of land. The Blight is evocative of a dry, burned wasteland. The Shores hopefully provides the reader with images of a more fertile, green land touching the sea. The Red Desert suggests an image of something like a red Tatooine from Star Wars. Finally, the Eastern Expanse should provoke the flat, nearly endless plains of America’s heartland (although the exact setting of this story hasn’t been pinpointed). 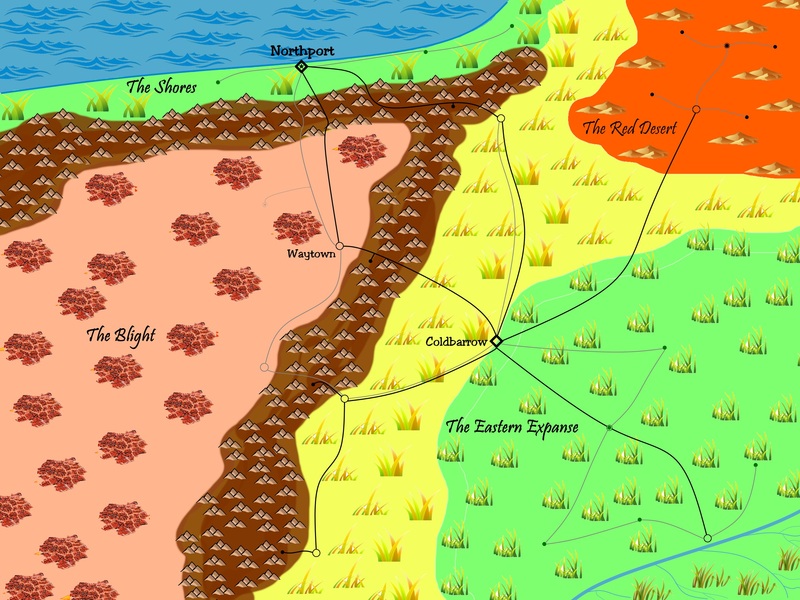 Creating this map helped the setting become real to me and from there, I was able to visualize places and make connections between locations and settlements. Drawing a map helps me create a living, breathing world that becomes its own character. Certainly, Waytown should feel different than Coldbarrow, and so forth. From these humble dots and lines, vibrant towns emerge with marketplaces, hospitals and more.